Primavera P6 is an enterprise project portfolio management software. It involves project management, product management, collaboration and control capabilities, and integrates with other enterprise software such as Oracle and SAP’s ERP systems. Primavera P6 hot key commands increase users performance and allow users to create and manage their schedules quickly. Oracle Primavera P6 gives control, monitoring, and insight to planners, project managers, schedulers, employers, stakeholders, and any others who are involved in a given project. There are some commands in Primavera P6 Professional and Primavera P6 EPPM which enables saving time while you are creating a workschedule. Many users are unaware of their benefits. 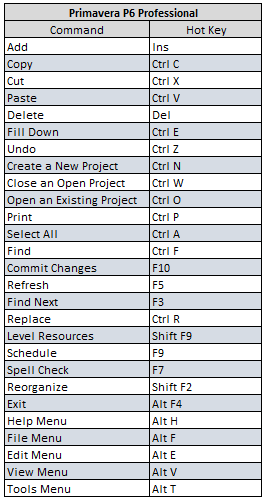 Here below you can see a list of commands available in Primavera P6. As you see, Primavera P6 EPPM commands are a bit different than Primavera P6 Professional commands. Note that Primavera P6 is a powerful tool for project, program and portfolio management. 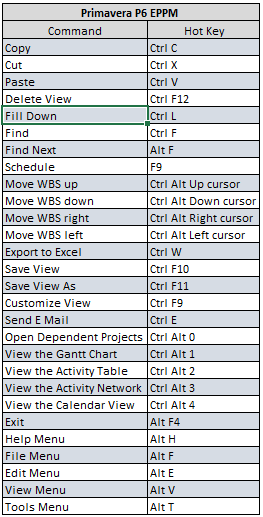 Understanding the use of hotkeys will help you to use this program effectively. Projectcubicle.com involves many tutorials and articles to help you to use the Primavera P6.